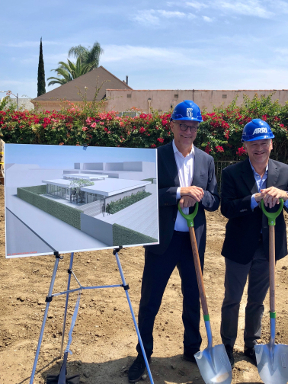 The American Society of Cinematographers (ASC) broke ground today on the construction of the new ASC ARRI Educational Center. The contemporary building, located behind the historic ASC Clubhouse in Hollywood, will serve as a hub for the organization’s ongoing efforts to educate the next generation of filmmakers on the art and craft of cinematography. The structure also will be home to all print and digital publications staff. The ASC ARRI Educational Center offers a modern, inspired space with offices and meeting rooms, and is slated to be completed by 2019. ASC President Kees van Oostrum was joined by ARRI Inc. President and CEO Glenn Kennel at the groundbreaking ceremony. The educational center is made possible through the patronage of ARRI, a pioneering technology company that has a longstanding relationship with the ASC and its membership. The ASC and ARRI previously collaborated on the launch of the International Master Class series, intensive workshops taking place around the world with acclaimed ASC members. ARRI will continue to sponsor the International Master Classes for the next decade and host various Los Angeles-based Master Classes beginning in 2019. The ASC began its educational mission in 1920 with the publication of its flagship magazine, American Cinematographer, which covers the artistic approaches and motion-imaging techniques of filmmakers. The society has cultivated its educational efforts over the century by establishing a number of programs to promote learning on a global basis. Its Education and Outreach Committee organizes frequent events for the benefit of filmmaking students and the general public, including week-long Master Classes taught by renowned ASC members. Additionally, the organization hosts the annual Student Heritage Awards honoring both graduate and undergraduate film students; regular camera and lighting seminars; “Coffee and Conversation” Q&A sessions analyzing the work of cinematographers on a specific project; roundtable discussions featuring panels of professionals who address a variety of topics central to the work of camera people and other industry disciplines; and a bi-annual International Cinematography Summit bringing together participants from dozens of cinematography societies from around the globe to meet, share information, and prioritize an agenda that will forward the interests of cinematographers everywhere. More recently, the ASC Vision Committee was inaugurated to promote diversity throughout the industry with a series of popular and highly engaging seminars and events devoted to nurturing an open dialogue and progressive hiring practices for women and minority filmmakers. ASC was officially chartered in January 1919. Today, the organization has some 380 members. For more information, visit www.theasc.com.